Question: I was told by my dermatologist that I have traction alopecia. What are some things that I can do at home to try and get my hair growing back healthy and strong? Answer: Hi T, firstly you need to identify what, precisely, is causing your hair loss. In cases of Traction Alopecia this is usually the frequent wearing of tight hairstyles, hair extensions, weaves or a combination of these. Stop whatever it is that is causing the issue and preferably wear your hair naturally to help your recovery. Or, if you absolutely need to, keep your hair off your face by using a soft alice band, or tie it back loosely. Traction Alopecia occurs when too much strain is placed on the follicles due to tension – for instance, that caused by pulling the hair back into taut styles such as a high ponytail or braids – or extra weight – including that which is added by hair extensions. As such, in order to regrow hair, the goal is to rest the follicles completely in order to allow them to recover. In addition to wearing your hair naturally, trimming off any split ends or hair breakage – which is often seen in cases of Traction Alopecia – you could look into maximising your hair’s health and vitality through your diet. By ensuring it gets strong nutritional support you can help to maintain healthy hair growth. 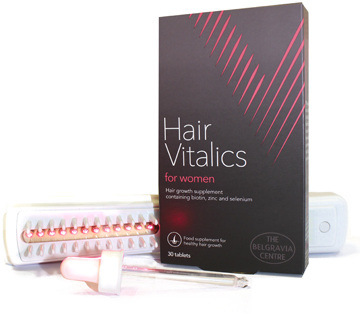 If you feel you are not getting enough or a wide enough range of the key vitamins and minerals needed for this, you could consider taking a food supplement, such as Belgravia’s highly-targeted one-a-day Hair Vitalics for Women. This premium supplement can also be taken alongside a hair loss treatment course. In cases where the hair follicles do not get the chance to rest properly – or when the condition has gone un-diagnosed for a long time – it is possible for them to deteriorate and become permanently damaged. Should this happen, as the follicles would no longer be capable of producing hair, it can cause permanent baldness in the affected areas. This tends to present as bald patches around the sites of tension, and as a receding hairline. If the hairloss is not too severe then the hair should regrow naturally as long as the follicles are properly rested until normal, healthy hair growth resumes. 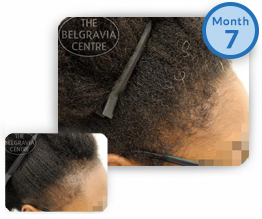 Alternatively, Belgravia offers custom traction alopecia treatment courses to help speed up this process. 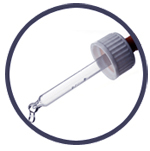 These involve recommended formulations of the topical drug high strength minoxidil, which is applied directly to the scalp, and additional home-use hair growth boosters may also be beneficial. Should you decide to explore treatment – which is used at home – you can receive personalised advice and recommendations by popping by our City of London or Central London hair loss clinics for a consultation, or by completing our online consultation form.